The theme of Japanese Corporate Pavilion is “Better Life from Japan”. The pavilion will utilize converted old premises to show Japanese entrepreneurs’ interpretation and understanding of the theme “Better City, Better Life”. 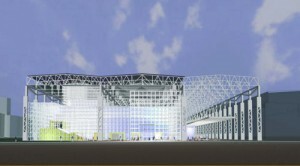 It will be built in a 4,000-square-meter old factory at the Jiangnan Shipyard in the Puxi section of the Expo site. Fourteen Japanese corporations will invest the pavilion and the organizers of the pavilion will invite more sponsors to display for more diversity. Japanese Pavilion will feature a number of latest scientific and technological achievements and environmental concept to give a vivid interpretation of contemporary Japanese new values and to picture the lifestyle in the future. Inside of the pavilion will consist of the theme display, cell display, food, souvenirs and other areas. This entry was posted on Tuesday, December 8th, 2009 at 11:40 am	and is filed under Corporate Pavilion, Pavilion. You can follow any responses to this entry through the RSS 2.0 feed. Both comments and pings are currently closed.